A major study of all penguin species suggests the birds are at continuing risk from habitat degradation. Writing in the journal, Conservation Biology, a group of internationally renowned scientists recommends the adoption of measures to mitigate against a range of effects including; food scarcity (where fisheries compete for the same resources), being caught in fishing nets, oil pollution and climate change. This could include the establishment of marine protected areas, although the authors acknowledge this might not always be practical. A number of other ecologically based management methods could also be implemented. Populations of many penguin species have declined substantially over the past two decades. In 2013, eleven species were listed as 'threatened' by the International Union for Conservation of Nature (IUCN), two as 'near threatened' and five as 'of least concern'. In order to understand how they might respond to further human impacts on the world's oceans the scientists examined all eighteen species, looking at different factors where human activity might interfere with their populations. Forty-nine scientists contributed to the overall process. 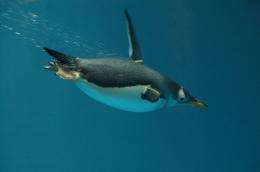 They considered all the main issues affecting penguin populations including; terrestrial habitat degradation, marine pollution, fisheries bycatch and resource competition, environmental variability, climate change and toxic algal poisoning and disease. The group concludes that habitat loss, pollution, and fishing remain the primary concerns. They report that the future resilience of penguin populations to climate change impacts will almost certainly depend upon addressing current threats to existing habitat degradation on land and at sea. The group of scientists recommends that the protection of penguin habitats is crucial for their future survival. This could be in the form of appropriately scaled marine reserves, including some in the High Seas, in areas beyond national jurisdiction. "Penguins and humans often compete for the same food, and some of our other actions also impinge upon penguins. Our research highlights some of the issues of conservation and how we might protect biodiversity and the functioning of marine ecosystems. "Whilst it is possible to design and implement large-scale marine conservation reserves it is not always practical or politically feasible. However, there are other ecosystem-based management methods that can help maintain biodiversity and a healthy ecosystem. For example, the use of spatial zoning to reduce the overlap of fisheries, oil rigs and shipping lanes with areas of the ocean used by penguins; the use of appropriate fishing methods to reduce the accidental bycatch of penguins and other species; and, the use of ecologically based fisheries harvesting rules to limit the allowable catches taken by fishermen, particularly where they target species that are also food for penguins." The scientists believe their work will be of benefit to other studies of animal species, not just in the southern hemisphere, but the northern one too, where human impacts on the environment is even greater. More information: "Pollution, Habitat Loss, Fishing and Climate Change as Critical Threats to Penguins" by Phil Trathan, Pablo García-Borboroglu, Dee Boersma, Charles-André Bost, Robert Crawford, Glenn Crossin, Richard Cuthbert, Peter Dann, Lloyd Spencer Davis, Santiago De La Puente, Ursula Ellenberg, Heather Lynch, Thomas Mattern, Klemens Pϋtz, Philip Seddon, Wayne Trivelpiece and Barbara Wienecke is published in Conservation Biology this week.